Knitting the socks for my hubby is taking longer than I had anticipated, because I have to do it while he's not around. He's not always the most observant of individuals, but I don't want him to get suspicious either. He does occasionally ask, and the one time I don't want him to, will be the one time when he will. I'm almost done with the first one, and I hope to get a picture next week. 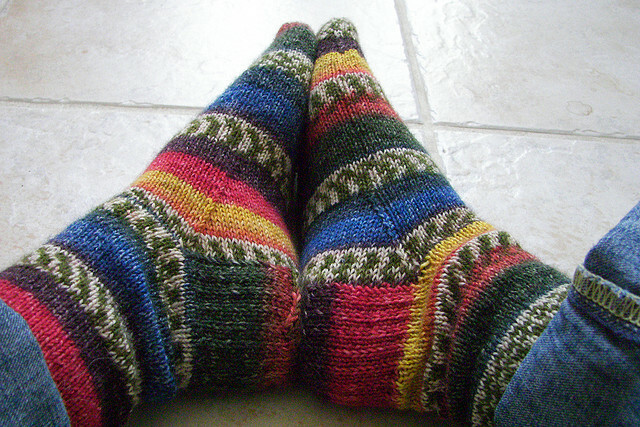 I'm using Stephanie Pearl-McPhee's sock recipe in her Knitting Rules book. You know what's funny? I actually have these exact same socks. They were the first socks I ever knit. They're big, but so comfy, and they're perfect comfort socks. When it's grey, and rainy, and cold, those are the socks I love to grab and put on. Happy weekend - this weekend's going to be filled with Thanksgiving preparations.